Isabel was born into the Portuguese royal family known as the Illustrious Generation. Her parents were renowned rulers and they were to raise several celebrated children. Her older brothers were King Edward of Portugal, Peter, Duke of Coimbra and the famous Henry the Navigator, patron of Portuguese navigation. Isabel was to make a brilliant match to the Duke of Burgundy but not until she was into her thirties, very late for a Renaissance princess. Isabel was born on February 21, 1397 in Evora. Her father was King John I of Portugal of the house of Aviz. Her mother was Philippa of Lancaster, the daughter of John of Gaunt, Duke of Lancaster and granddaughter of King Edward III of England. Isabel’s father had become King with the help of John of Gaunt and cemented his alliance and friendship with Gaunt and England by marrying Philippa. Isabel was to value friendship with England all her life. Isabel was the only surviving daughter in her family with five able-bodied brothers. She was allowed to play with the older boys, Duarte (known in English as Edward), Peter and Henry and helped look after he younger brothers, John and Ferdinand. All the children in the family were supported in developing their minds and bodies. They were taught several languages such as Latin, French, English and Italian. They were urged to do scientific experiments and tutored in mathematics. Isabel was to excel in accounting. She was allowed to accompany her brothers when they were instructed in affairs of state with their father. She joined them in riding and hunting. She observed the many visitors to her father’s court. The first offer for Isabel’s hand was in 1415 when Henry V of England approached Isabel’s father. The negotiations didn’t amount to any match. Isabel was very close with her mother. When Philippa died in 1415 Isabel was inconsolabe. She withdrew from court life, seeking the company of her ladies in waiting. During this time she practiced her needlework and music and cultivated her interests in books and politics. There was not another offer for Isabel’s hand until December 18, 1428 when she was thirty years old. Philip the Good, Duke of Burgundy had already been married and widowed twice by 1428. Because Burgundy was allied with England at that moment, he was seeking an English wife or a match with a country allied with England. His ambassadors had discussions with Isabel’s father and brothers and a formal request for her hand was tendered and accepted. A notarized marriage contract was presented to the Burgundian ambassador on July 23, 1428 and a proxy marriage was performed on July 24 in Portugal. There were eight weeks of celebration before Isabel sailed for Burgundy on October 19. Her voyage was very rough and took eleven weeks. She arrived at Sluys on Christmas Day and a formal wedding ceremony was performed on January 7, 1430. The marriage was consummated shortly thereafter. There were weeks of celebration and afterwards, Philip and Isabel went on a progress through Burgundy and other territories owned by the Duke. By May, Philip was off to fight against Joan of Arc. Philip ordered Isabel, who by now was pregnant, to go north to avoid the war. While there she used her diplomatic skills to settle grievances between the guilds, artisans and merchants in Flanders. She managed to lessen tensions and also extracted funds from various parties to help Philip pay for his wars. By Christmas of 1431, Isabel was awaiting the birth of her first child. Philip was showering her with gifts and attention at the same time he was entertaining his various mistresses and other beautiful women. Philip didn’t hide his dalliances so Isabel knew her husband wasn’t faithful. Their son Anthony was born on December 30. Isabel was now aware of the threats to Burgundy’s independence and stability from France. She was urging Philip to have stronger ties with England. Philip was being advised to strengthen ties with France by nobles who were bribed by the French. This difference in opinion was to cause conflict between them for the duration of their marriage. Philip also wanted his territories to be recognized as a Kingdom, seeking a crown for himself. He was looking for this honor from the Holy Roman Emperor and the Pope. After the birth of their son, Philip and Isabel spent time together and she was soon pregnant again. Philip left to defend Burgundy against the French leaving Isabel as regent. On February 5, 1432, Anthony died. Isabel was devastated. On April 23, 1432, her second son, named Josse was born. Although she insisted on caring for the child herself and hovered over him, he died four months later. Philip and Isabel spent the winter together and Isabel soon found herself pregnant once more. She and Philip traveled throughout the Duchy. Isabel was adept at managing and settling financial and administrative matters as well as raising funds for her husband. Isabel became focused on her goal of helping Philip secure Burgundy and providing an heir for the Duchy. She wanted her heir to rule over a Burgundy that was independent of France, rich and powerful and on the same level as England in political strength and influence. A strong healthy son named Charles was born on November 23, 1433 in Dijon. She quickly had him baptized and his father created him Count of Charolais and inducted him into the chivalric Order of the Golden Fleece. Isabel was to remain in the southern part of the Duchy for nearly a year and a half when she was called to meet her husband to help broker a peace agreement between England, France and Burgundy. As hard as Isabel tried, her husband was working against her and the English ended up leaving the talks in disgust. But peace was brokered between Burgundy and France for the moment. From 1438 to 1445, Isabel was at the center of Burgundian politics. She raised money and troops when Philip needed them. When Philip was absent she was responsible for the government. She tackled the challenge of rebellious towns and successfully brokered agreements between merchants and trade guilds. Philip put her on a commission to review the finances of all his territories. She relished the job using her expertise in accounting and business. Philip allowed her to formulate policy in domestic and international affairs. In the summer of 1439, a conference was called in Gravelines. One of the items considered just before the conference began was the marriage of Isabel’s son to one of the daughters of King Charles VII of France. The daughters came to St. Omer and the elder daughter, Catherine, was chosen. She was eleven years old and on June 11, she was married to the seven year old Charles. After the wedding the conference between France, England and Burgundy once again ended with the English departing with no agreement. However, Isabel managed to detain the English and brokered a trade agreement between England, Flanders and Brabant that was to last for seven years. In May of 1443, Isabel realized her most ambitious dream when she finally brokered a treaty of perpetual peace with England. Between 1443 and 1454, Isabel attended to her duties as de facto ruler of Burgundy. She increased her holdings and income and became a woman of independent means. 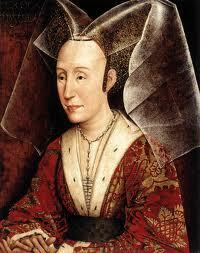 She arranged the marriage of her husband’s niece, Mary of Guelders to the Scottish King James II in April of 1449. She closely watched events in England during the Wars of the Roses. Despite her heritage, she was to become pro-Yorkist. Her daughter-in-law, Catherine had died in July of 1446. There were arguments between Isabel and Philip over who should be Charles’ second wife. Philip wanted his niece, Isabella of Bourbon for his son. Isabel wanted an English match and in 1454 was negotiating with Richard, Duke of York for his daughter Anne’s hand. 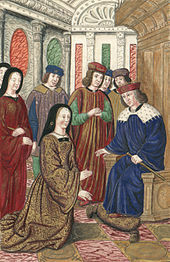 Philip managed to stall the marriage agreement Isabel had made with England and hastily married Charles to Isabella of Bourbon on October 30, 1454. At first Isabel was furious and did not acknowledge her daughter-in-law according to court etiquette. Eventually, she accepted Isabella. The marriage turned out to be a success and produced a baby daughter named Mary who eventually ruled as Duchess of Burgundy. By 1455-56, Philip came under the powerful influence of the De Croy family, leaving Isabel with less of a role in government. Philip’s health was deteriorating. He began to withdraw from politics and started pursuing mistresses and petty pastimes. In 1457, Isabel retreated to her castle at La Motte-au-Bois. She was to continue her charitable church and hospital work and take a much needed rest. She was sixty years old. In June of 1458, Philip suffered a stroke after a tennis game. Isabel flew to his side. He begged her to nurse him and she accepted, apologizing for the tension between them. She would personally nurse Philip through his various illnesses for the rest of his life. Isabel’s influence was restored. She worked even harder to get an alliance with England. Isabel and Philip’s son Charles took an increasing role in administrative and military affairs. Charles’ wife Isabella of Bourbon had died on September 25, 1465. Philip the Good, Duke of Burgundy died on June 15, 1467. Isabel negotiated a marriage alliance with King Edward IV of England to marry his sister Margaret of York to Charles, basing the marriage contract on her own marriage agreement. 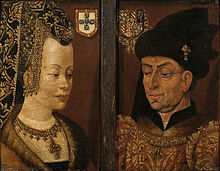 The marriage of Margaret of York and the new Duke of Burgundy was celebrated on July 9, 1468. Margaret and Isabel got along very well and enjoyed each other’s company. In 1471, Isabel was 74 years old and tired. She began to put her affairs in order. She made arrangements for gifts to religious orders and houses for the sick, a large gift for her granddaughter Mary and prepared the documents to transfer her home at La Motte-au-Bois to her daughter-in-law Margaret. She notarized the patents for transferring her claim to the English throne to her son Charles. From October 21st on, Charles, Margaret or Mary was by Isabel’s side. She got to the point where she could no longer eat. Her family watched as the diminutive Duchess faded away. On December 17th, she finally expired in the arms of her son. She was buried temporarily until suitable tombs could be built for her and Philip. In February of 1474, Charles had his parents re-interred in the Chartreuse de Champmol in Dijon. They were to lay there undisturbed until the chapel was destroyed in 1793 during the French Revolution. Isabel was also a descendant of Robert II of France along her father’s line, albeit he was born illegitimate in the eyes of the Church. Thus, she could claim lineage from both a Lancastrian (Philippa) and a Burgundian (John I). The eldest son of D. Joao I of Portugal , and D. Isabel brother was D.Duarte , not Edward . In Portuguese we translate Eduardo / Edward . Duarte is common name in Portugal , I don’t know how to translate it to English . The following post comes from Susan Abernathy and her great site, The Freelance History Writer. Isabel of Portugal was the Duchess of Burgundy at a time when her native Kingdom of Portugal and her adopted home of Burgundy were becoming major players on the scene. If you haven’t spent any time on Susan’s blog, you should check it out. And kudos to her parents for educating their daughter, too! So many people thought education was unnecessary for a girl, or even detrimental. Strong and independent woman who died at an old age for that period. I would imagine many were happy with her demise.